BOSTON: Police Academy Cadets Graduate As First Openly Gay Couple - Joe.My.God. Jimmy Moccia and Shawn MacIver will make a small but significant piece of local history tomorrow. 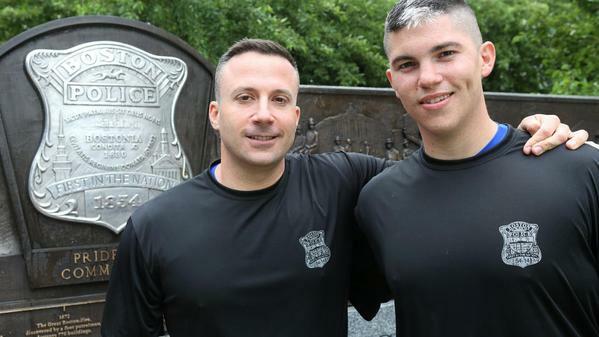 They will become the first openly gay couple to graduate from the Boston Police Academy. Both men scored 100 on their civil service tests. They have been together for five years, and yesterday, in a steady rain, they completed the traditional eight-mile run along with their recruit class 5414, from the police academy in Hyde Park to Schroeder Plaza. Moccia, who grew up in Hyde Park, has a father and brother who are also Boston cops. “I think it’s important to note that throughout the entire academy experience we were never afraid to be ourselves,” he said after yesterday’s run. “I’m not going to lie. I was pretty nervous on the first day back in December,” he said, “I sort of didn’t want people to find out because I didn’t want people to look at me differently. I wanted people to get to know us. We didn’t want to be known as ‘the gay cops.’ We’re cops who just happen to be gay. There’s so many other things we are. Yeah, gay’s on the list, but it doesn’t define us. Previous A Clue From Notorious RBG?